As we enter the new millenium, it is abundantly clear that humankind has squandered many of the earth’s precious resources. In addition, we continue to utilize toxic, often deadly sources of energy. Moreover, through arrogance, ignorance and irresponsibility, we continue to behave reprehensibly by continuing to build, test, and stockpile weapons of mass destruction and to allow the spread of nuclear weapons for profit around the world. We maintain nuclear arsenals under the misguided and arrogant notion that we as a nation possess the wisdom and compassion necessary to avoid their usage, and that possession of these weapons might stop people from making war. This notion flies in the face of an obvious and historical reality. People have been taught to believe that this situation is permanent; however, there is a way out. We currently possess the knowledge, and in several instances the technology to provide the energy that we require for both personal and industrial use, without continuing to risk our own demise. These technologies are environmentally safe, abundant, potentially more productive, and certainly as profitable as the limited technologies and energy sources into which we are currently investing many billions of dollars. These include solar, wind, hydrogen, biomass, and with enough research funding, may soon include cold fusion and zero point energy (also referred to as space or free energy). These technologies have not been properly developed for a variety of reasons, none of which can be considered viable or even rational when viewed from the perspective of what is best for humankind. These new technologies have been largely ignored, both by the U.S. Government and particularly by Corporate America. While there is nothing intrinsically wrong with business for profit, there is a case to be made for decisions that favor people and life over accumulation of profit and wealth. In fact, it is reasonable to postulate that the corporations that pioneer and/or shift into the new technologies should reap tremendous and sustained revenues, much like those that made timely entries into the computer/high tech arena. However, the circumstances as they currently exist are that energy sources are and have always been controlled by a small group of corporate entities. These corporate entities enjoy an intimate and often incestuous relationship with the government, vis-à-vis the Defense/Military establishment. This often unholy alliance keeps us squandering tremendous resources on unnecessary weapons systems and finite energy sources. We are all participating in the worse possible lose/lose scenario imaginable. First, fossil fuel sources that we now rely on for most of our power needs are depleting at an alarming rate. 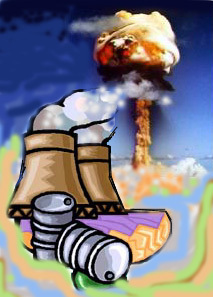 Second, nuclear technology produces toxic wastes. Third, our weapons systems of mass destruction are supposedly deterrent weapons, meaning that since everyone has them, no one will dare to use them because the results would be catastrophic. Should one follow this reasoning to its logical conclusion, then these weapons will never be used and we will have poured trillions of dollars into a “black hole”, not to mention the misuse of time and other resources that can never be recovered. The United States Congress has the responsibility to collect and spend the people's money. Having that authority, Congress has spent nearly 6 trillion of the people's dollars on nuclear weapons alone over the past 50 years. Billions of dollars continue to be spent each year to develop, enhance and maintain nuclear weapons and power facilities, and to contain the toxic wastes that nuclear technology produces. Billions more are spent annually in like fashion to supply us with fossil fuel based energy. Clearly, Congress is acting irresponsibly with the people's money. Responsible stewardship would mandate amortizing the 6 trillion dollars over the next 50 years, using it for more humane endeavors. Responsible stewardship should not include spending resources on fossil fuel based industries because these fuel sources are rapidly depleting, some scientists predict within 50 years. Fossil fuels are also said to be major contributors to the greenhouse effect. Responsible stewardship should not include spending resources on nuclear energy technologies because these technologies have proven to be unsafe (e.g. Chernobyl in the former Soviet Union and Three Mile Island, USA). In addition, the extremely toxic waste material produced by these power plants is yet to be safely contained. The most irresponsible stewardship of the people's resources is the continued presence of nuclear weapons. There is worldwide consensus that these weapons should never, indeed, must never be used again if we hope to continue to exist on this planet. The people's money would be more intelligently spent on sources of energy that are abundant and life enhancing. The Conversion Project will lobby Congress to pass laws that will provide incentives for the scientific community and the business community to research, develop and mass produce wind, solar, hydrogen, biomass, and any other environmentally compatible and infinite energy source technologies. These laws and initiatives must be creative and comprehensive. It is a given that companies are in business to make and maximize profits. However, over the past twenty years, the concepts of corporate responsibility and corporate good neighboring have become part of the business lexicon. Initially, these initiatives were considered unnecessary expenses and met with very rigid resistance within the corporate community. Over time of course, businesses around the globe began to understand the importance of these concepts and thus began to realize tangible financial and spiritual benefits. This phenomenon provides the basic foundation and approach for The Conversion Project’s lobbying efforts toward the corporate world. In short, our message to industry is that it is morally responsible AND financially advantageous to phase out the business of finite and toxic energy production and to phase in clean, safe, infinite energy technologies. This will undoubtedly be a formidable challenge because it is basic human nature to resist change. Certainly, it is in the nature of big business to avoid forays into unknown and uncharted waters. That was in large part the reason for such intense initial reluctance of businesses to take the high-tech leap during the 1970’s and 80’s. However, once the Federal Government and the academic community began initiatives to stimulate that industry and a few visionary companies began to promote and to mass-produce high-tech products and services, the information and high-tech industries exploded. Many of those visionary companies and others that joined in later have produced legendary revenues, profits, and dividends for tens of thousands of shareholders. Perhaps the most well known examples of this phenomenon are of course, Apple Computers and Microsoft, Inc. The Conversion Project asserts that the legendary stories of the new energy technology field have yet to be written; that the legendary revenues, profits, and dividends have yet to be earned. Therefore, simultaneous to our lobbying efforts in Congress, we seek to persuade Corporate America that it can enhance the quality of life for humankind and at the same time stay true to its primary bottom-line objectives. Information is the most valuable commodity as we enter the next millennium. Although there has been a fair amount of research done in various areas of new energy technologies, much of this research is not easily accessible to the business community, the activist community, the general public, and even to the government and scientific community in some cases. In order to reach a consensus regarding comprehensive phasing in of the new energy technologies, more complete and accurate information about them must be made available. The Conversion Project will seek to fill this void by collecting and disseminating up to date information about solar, wind, hydrogen, biomass, cold fusion, and other alternative technologies as it becomes available and on a continuous basis. This information will be made available on the internet within the web pages of the Proposition One Committee. This is a somewhat delicate issue because it seems to be an unspoken truth within the scientific community. A major impediment to accomplishing completed working models of the various alternative technologies and in many instances even reaching agreement on the validity and viability of certain technologies, is the seeming inability of scientists of differing fields of study to work together in a productive manner. An illustrative example of this phenomenon is seen in the efforts to verify "Zero Point Energy" (ZPE). More mainstream physicists discount the validity of this concept based upon the fact that some Z.P.E. experiment results are in violation of the known laws of physics. These scientists are then shunned by the mainstream scientific community, making efforts to get funding impossible and therefore slowing down or halting further experimentation. Also, there are far too many instances of researchers from different nations who may be working on similar or identical projects refusing to share data and in some cases, outright hiding of data, which in turn prevents the possibility of major breakthroughs. Moreover, there is often a contentious relationship between the theorists in a given field and the engineers who must ultimately build the mechanisms that bring the theories to fruition. The Conversion Project asserts that these obstacles, born of misplaced ego and destructive nationalistic pride, are counter-productive and no longer acceptable. Humanity's need for more life enhancing technologies far outweigh these frivolous motivations. Therefore, we will seek to bring these disparate groups together through direct consultations, conferences, symposia and any other reasonable methods that will propel us toward the truth. For more information or to express interest in serving in an advisory capacity, please e-mail us.